The network functions as the mission-critical backbone of the data center, tying together dynamic, virtualized application servers and storage pools, while supporting the access controls, performance guarantees, and availability required for multi-tenant environments. Proprietary, vendor-locked products simply cannot deliver the innovation, agility, and efficiencies business requirements demand. The modern Software-Defined Network (SDN) removes limitations and enables data centers to abstract, pool, and automate infrastructure resources and services at hyperscale, while supporting dynamic, innovative application workloads to meet changing business needs. Penguin Computing pioneers the design, engineering, integration, delivery, and support for complete, Linux-based, open technology solutions. Penguin Computing® Arctica® white-box data center switches are 1U, ONIE-enabled, layer 2 / layer 3 fabric switches, available for 10/40 GbE and 25/100 GbE network architectures. All Arctica data center switches are rigorously tested and certified for recommended Network Operating Systems, including Cumulus Linux and Canonical Ubuntu with Broadcom ICOS protocol stack. 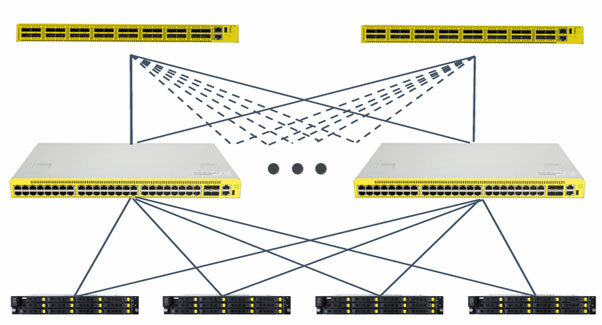 Penguin Computing offers legacy 1 GbE switches as well as rack, cable management, cable, and connector solutions.